Ream should take the blame for the first goal. Though the first headed clearance before his wiff was kind of crap and then Erickson still had to put in a cross for deli to head in (under slack marking) at the back post. To be fair other defenders didn’t really have tome to reset after reams wiff and properly Mark. None of these goddamm non-top-six clubs know how to hang on in the final minutes against the marquee teams . It's like their assigned task to play the part of the Washington Generals just so Spurs or City or Liverpool get all the glory. Least competitive EPL season I've ever seen. The gap between 6th and 7th is 11 points. It really is the top 6 and everyone else. The bottom 14 are dire. Agreed and the bottom 7 are really bad. What a ridiculous way to lose in the last few seconds. Ream had a good game, except for the whiff on the clearance that led to Spurs first goal. Seems to be his MO. Ream beaten to a header by Llorente at 1:46, has a nice ball over the top to Babel at 1:54 though the play is called back for off-sides, the first Spurs goals with Ream's whiffed clearance is at 3:46. Arlo White was talking about how big a point this was for Fulham in like, the 88th minute. I said that there was no way Fulham was getting a point, and here we are. I've always found it strange that English announcers rush to prematurely declare the result of a match. I’ve noticed this too with the announcers - it’s very strange. The Good: Tim was not responsible at all for their 2nd goal. The Bad: He deserves a bit of blame for their 1st. Ream not the worst defender in that hapless team. Not today, at least. All calls are going to the Spuds. That's something I really hate about the EPL now, how blatant they are in giving a hand to the wealthier clubs. I wonder how much is decided in back rooms where they are counting the ticket sales. Or is the TV revenue so big that they don't care about the size of Craven Cottage? Dunno. The atmosphere at Craven Cottage should be good for TV audience, I'd think. Spurs really did not play like a marquee team with Llorente (and absence of other key players). Given that Fulham is so far behind on the table, should they really just hang on for the one point in this match? LouisianaViking07/09, Winoman, edcrocker and 2 others repped this. This is a must-win if they want to survive: at home against a lower-half-of-the-table team that is doing badly. edcrocker, neems, Tom Collingsworth and 1 other person repped this. Unfortunate for him. I don't think he was responsible for either goal, based on the brief highlights I watched. 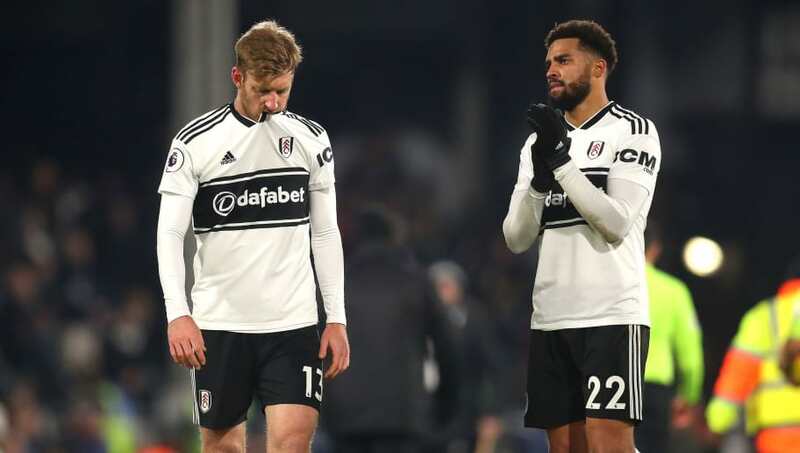 In any event, Fulham are currently staging a comeback and have leveled the score at 2-2. And Fulham now lead 3-2. Ream is a positional donkey. I didn’t see the game, but that is always a kick in the gut to get pulled off early and then your team comes back for the win. Yup, its gonna certainly make Rainieri think......dont think its gonna benefit Ream much. Fulham may get out of this yet. Thank goodness Bournemouth trounced Chelsea and Leicester held Liverpool. Some semblance of parity, at least. Tom Collingsworth, LouisianaViking07/09 and OWN(yewu)ED repped this. I've watched a decent amount of their games this year. Honestly they could still stay up, they just need to stop the goals. They've looked really good under Ranieri at times. A win this weekend against Crystal Palace would all but put them within three points out of climbing out of the relegation zone. Cardiff has 19 points, and then there are three teams (Palace included) sitting at 23 to Fulham's 17.